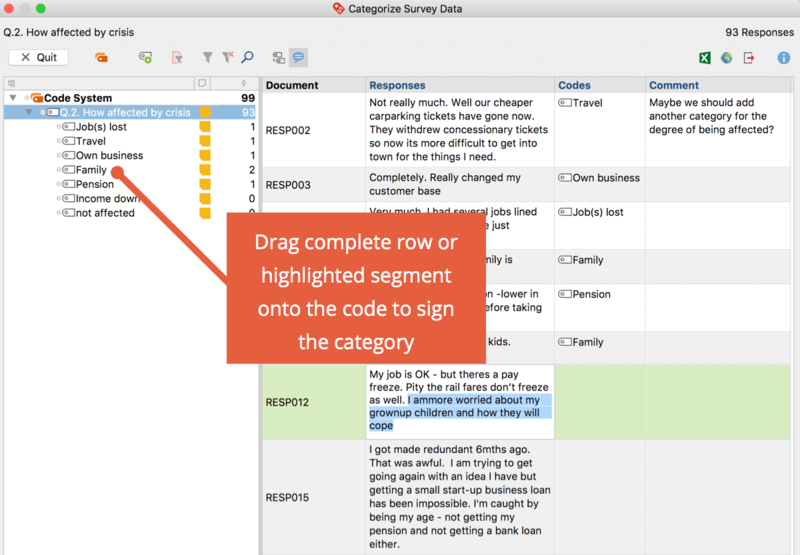 How does MAXQDA help you categorize survey responses? MAXQDA helps you analyze responses to open questions in surveys efficiently and effectively with its interactive table window. These responses are listed in a table and can be categorized with existing or newly formed codes. A prerequisite for using this function is that all the responses to a question have been coded. This should be the case if you used the Survey Data Import function to import your survey responses. The name of the code will normally correspond to the text or a shortened version of the survey question. Should you wish to analyze only a selection of responses of individual interviewees, activate these documents. If you activated a selection of documents, you can use the Only activated documents function (You can turn this display of activated documents on or off at any time later). In the leftmost field of the window, you will see a reduced code system that displays the selected question code. New categories can be inserted here as subcodes and then assigned to the individual answers. The number at the end of the code line tells you how often the code was assigned to the documents you are currently analyzing. In the table immediately to the right, you see a list of the responses – each in a separate line. The number of currently displayed lines, i.e. the responses to be categorized, is indicated in the upper right corner of the window. At the beginning, this number corresponds to the number of people who answered the question. Document – The source of the response. Responses – The texts of responses of people who answered your survey. Codes – A list of the codes assigned to the response or part of the response; only the codes that are currently visible in the code system on the far left are listed here. The question codes, whose answers are currently being evaluated, are never shown here. Comments – Freely editable text field (up to 255 characters) for notes: useful for the developing suitable categories. Like all MAXQDA table widows, the individual fields can be adjusted: The columns can be adjusted in width and position with the mouse or hidden with a right-click on a column heading. A click on the heading sorts the column in ascending order, another click in descending order. Please note: All other MAXQDA functions are locked while the window for categorizing survey responses is open. Quit – closes the interactive table window. Alternatively, you can also click the X to close the window. All codes – displays all your project’s codes. When turned off, only the selected codes and subcodes are displayed. New code – creates a new subcategory which can be used to categorize the responses in the code system. The new categories are always added as the last subcategory. Only subcodes to existing codes can be generated, no codes at the top level. Only activated documents– Only the answers of the currently activated documents are displayed. The frequencies displayed in the code tree are adjusted accordingly. Filter – applies filters, which are defined by right-clicking on a column heading and selecting the Set Filter, to all columns. Display comments – displays comments field. In order to categorize individual responses, you first need some categories, of course! If you have already defined some or all of these categories before you begin your analysis, you can define them as new subcodes of your question code. Click on the symbol New code. In the dialog window that appears, enter the code name. To better distinguish between sub-categories, you can use assorted colors. You can also enter the description of these categories (i.e. which responses they are applied to) into the “Code-Memo” field. Click Add code to create a second and third code, and so on. Click OK to finish creating new codes. If at the beginning of the analysis, you haven’t defined any categories are defined and you would rather develop these from the material, you can start by reading some of the responses and then create one or more suitable subcodes. Tip: You can also use the comment column to collect ideas for categories for the first few responses, and define appropriate categories after working through several of them. To assign a response to a category, click and drag the row with that response to one of the displayed codes in the hierarchical code tree. This allocation is immediately displayed in the “Codes” column. To assign a category to only part of a response, double-click on the text, select the desired portion of text, and drag it to one of the categories in the code system. Even if you add the same code to multiple sections of a response, the code name is listed only once in the “Codes” column. Tip: By right-clicking on a row and selecting the function Create and apply new code, you can directly add a code and assign it to the entire answer. To remove a category assigned to a response, click the cross that appears when you move the mouse over a code in the “Codes” column. All allocations of the deleted category will then be removed from the response. Click on a code in the code tree to list all your coded segments under this category (the categorized answers to the survey question or parts of it). This way, you have an overview of the contents of individual categories. The blue highlighted row in the code system indicates which code is currently selected. The name of the selected code is also displayed at the top left of the window. Please note: The “Codes“ column always only shows the code names that were also assigned to the selected code. In the comments column, you can write a comment regarding each response. Comments can be used to summarize long responses, ideas for new categories, or for categories in the process of being developed. They are also good for noting notes along the lines of “still unclear”, “come back to this later” for hard-to-categorize responses. Double-click a cell in the “Comments” column to enter a new comment or edit an existing one. Comments are stored as a coded segment comment regarding the code selected in the code system and are highlighted in blue. You can pause your current categorization at any time by clicking on the button Quit or by closing the window. All your categorizations will be stored as codes in your MAXQDA project. 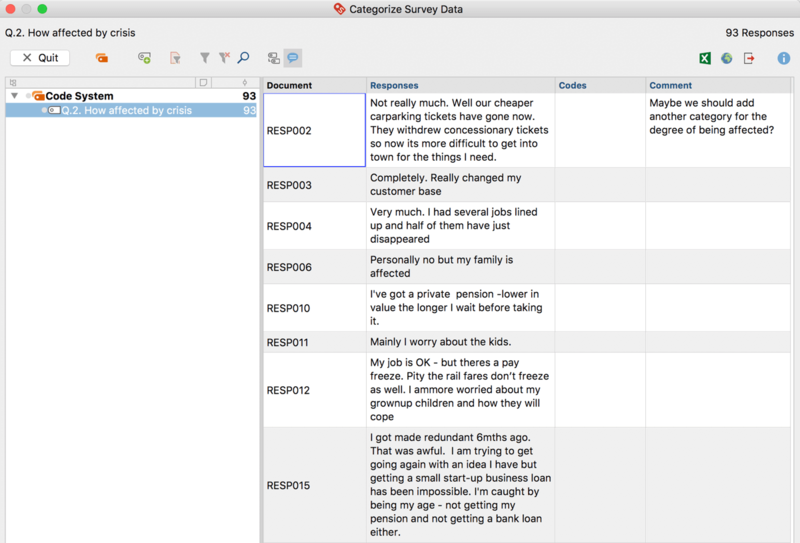 To pick up where you left off, restart the function via Analysis > Categorize Survey Responses and select the code that contains the responses to your survey question. The current display window can be exported using the usual icons at the top right of the window. All the rows (responses) in the right table are always exported.